The purpose of this thread is to summarize known properties and issues of Polymorph: Self spell in BGEE and BG2EE. @SionIV's great guide has become little outdated and I thought we could use a fresh summary. It seems to me that PlayItHardcore currently provides the most correct description of the spell, even though some points are no longer true in v2.5 (such as APR of the spider form). I'll try to do some more testing and highlight the differences applicable to the respective special forms. In BG2EE, the main difference from the previous versions of the game is that any buffs that increase or decrease attributes (e.g. Strength spell) will "survive" the transformation and will apply to the respective form even after morphing. Therefore, it's no longer necessary to use sequencers to buff your stats after you've changed the form. In BGEE this seems to work as in the original game. As a general rule, the caster's equipment (other than weapons) is not affected by the polymorph and he/she may rely on items' effects and special abilities when morphed. However, polymorphing from one special form (i.e. 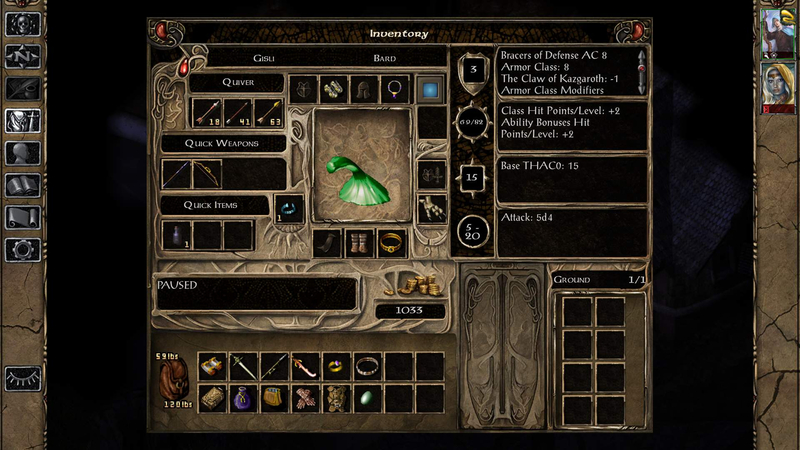 other than human) to another special form results in unequipping the entire inventory (apparently a bug). The items are not removed from their respective inventory slots, however, any effect they have is lost unless and until re-equipped. This is especially tricky with cursed items (the Claw of Kazgaroth) that become "unequipped" but may not be removed from the respective inventory slots without Remove Curse. Therefore, switching in between the special forms is currently very suboptimal, since you either have to deal with the inventory bug or take two rounds to get there. EDIT: Seems to be fixed in BG2EE. I'll be happy for any comments or additional input which could be then consolidated into a guide of a sort . All the forms use your base THAC0. All the forms have movement speed bonus, but none of them are truly hasted (despite the icon). This means it is possible to apply haste / improved haste to increase APR. Weapons used by all the forms strike as +1 (+3 in the case of Flind). Weapon style bonuses apply, e.g. single weapon for Spider and Ogre and two-handed for Flind. In BGEE, these may not be listed on the character record but still apply. Main hand weapons equipped prior to morphing do not provide bonuses (if any), but you may still access their special abilities. Off-hand weapons equipped prior to morphing do not provide off-hand attacks (despite the character record). However, their equipped effects (if any) will still apply and you may use their special abilities as well. Shields are treated in a similar manner. Note that in my install morphing to Flind (wielding a two-handed weapon) while using off-hand breaks the game. When polymorphed, weapons may only be un-equipped and not vice versa. While morphed, it's possible to use thieving skills, HiS, Find Traps, Bard Song, Turn Undead and special abilities. If your character is eligible for backstabs, all the forms (except for jelly, which uses ranged attack) are able perform backstabs as well. The jelly animation is rather big and it makes it rather difficult to move around obstacles and in narrow corridors. I have edited the original post to include my initial findings. What's up with the nerfs to Spider form? It's like they want me to stick with v2.3. It still gets modified by DEX for THAC0, the base Mustard Jelly form just doesn't have a DEX score that normally provides a bonus/penalty. for me is only one more reason to avoid upgrading, it seems to me that the EE developers are confusing their role of "enhancers", that is to give a modern interface, new content and fix bugs that in original had never been fixed, with the modder's role, that is altering the game balance to make the game something different from the original one, not an enhanced version of it. closing well known exploits, optional and part of the flavor of the original, and, as in the case of the spider form, changing something that was surely intended by the original game creators, not a bug, not an exploit and surely not a game breaking thing, is something that i really don't appreciate. i appreciated how they dealt with R/C giving the freedom to the player to have him learn all the druid spells like in not EE or making him learn only the druid spells a ranger should learn ( i don't even know if it is still possible with the latest updates). that way made possible to play it in a new way, as learning spells beyond the ranger capability was somehow a bug, and also to play the good old R/C the way we use(d) to do in the original version. this imho is enhancing, leaving to the player freedom of choice. to change a spell that was not bugged is modding, not enhancing, even if the modding action is done by the developers and not by an independent modder. When and why they nerf sword spider ? in my 2.3 is not nerfed. Could it be that it behaves differently in BGEE/SoD? Maybe @JuliusBorisov could point to us as to where to seek answers to the above questions regarding the nerfs/changes? Sword spiders don't do poison damage. No spiders that do poison damage have 4 APR. I dunno, I feel like a "Polymorph: ____" should polymorph you into a ____, not into some other monster. Should the ogre form have 20 STR? Ogres have 18/00. If the spell in 2.3 gave you 20 STR and in 2.5 they dropped it down to 18/00, my response would probably be "oh, I see the ogre form is correct now." I wasn't arguing against STR, only that it also gets DEX modifiers. The DEX modifier just isn't normally shown because the form sets DEX to 9, which has no bonus/penalty. (Polymorph) Shapeshift, (Giant) Spider: Is not hasted, but has 2 APR and a movement rate bonus. Enemy/summoned Giant Spiders have only 1 APR. (Avenger) Shapeshift, Sword Spider: Is still hasted, netting 5 APR total, matching the enemy/summoned Sword Spider. Not that there's any reason for them to be hasted. I've edited the original post to include my findings from testing the spell in BGEE (v2.5). There seem to be two major differences regarding (i) pre-buffing STR and DEX stats prior to morphing and (ii) switching in-between the special forms (which is bugged in BGEE). Thanks for pointing this out - you're correct. I've edited the summary. 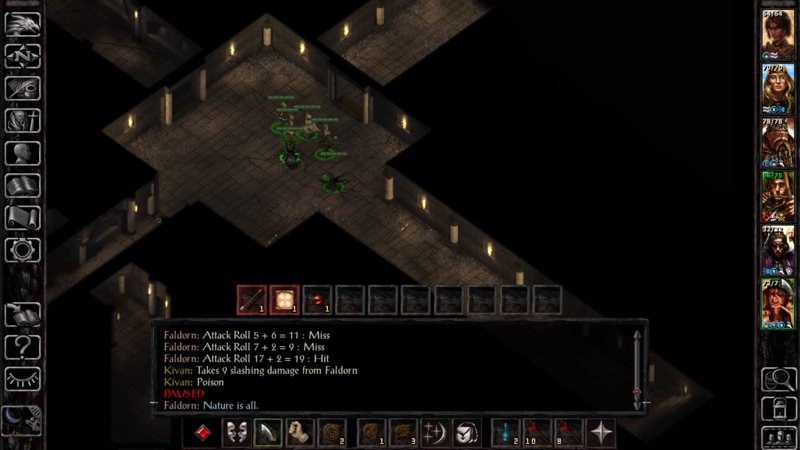 I thought it was pretty well-known that BG2 Spider form does automatic poison on hit. 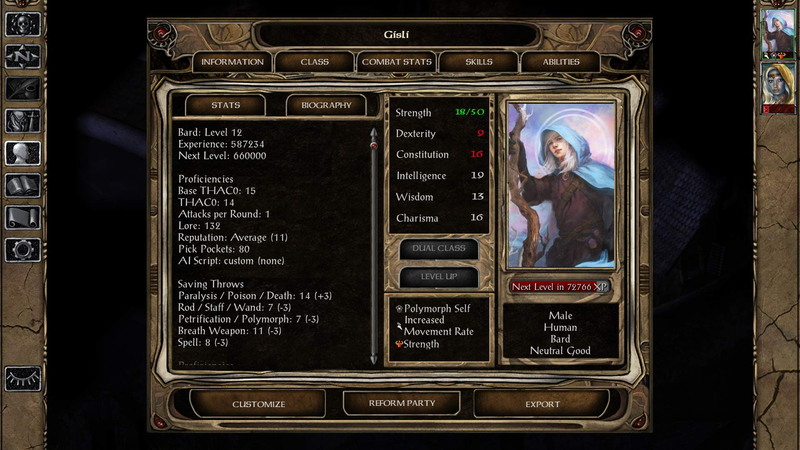 What BG2 spider does poison on hit? What BG2 spider does not do poison on hit? That does not invalidate my point. A sword spider it may be, but if they bothered to add a description to every shapeshifting subspell where there previously were none, and they didn't say to themselves, "Hey, while we're at it, shouldn't we do something about this on-hit poison since it's a sword spider? ", then it should stay. That they're changing it now (or at all, really) reeks of rebalancing which falls outside the purview of bugfixing, as I said. Though I can understand your point of view that this counts as a bug because it's a sword spider, I consider this a feature of the form. I took a look at the in-game description of the Polymorph Self spell as Xan had recently learned it. The description does not say that the form the spell gives access to is that of a sword spider, while it does say that it poisons the targets it hits. 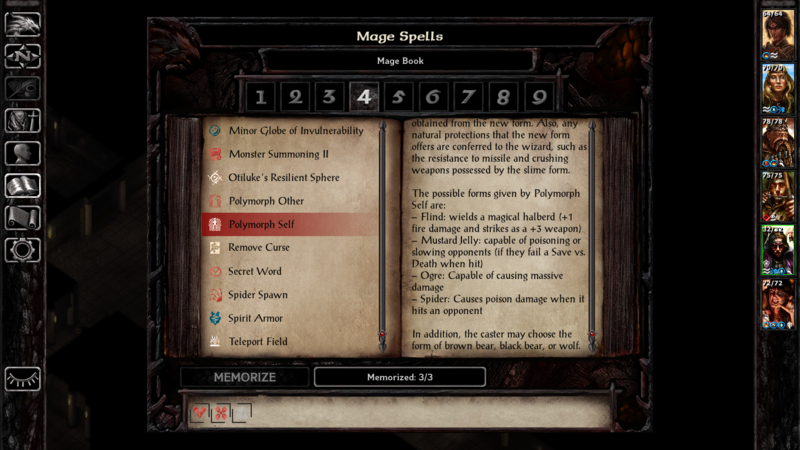 Beamdog's "nerfing" of the spell to that of a spider form with 2 APR and poison on hit can be justified as bringing the spell in alignment with existing (giant) spider forms in the game (even if it still enjoys increased movement speed unlike giant spiders). Without going against the spell description. Another fix could have been to retain 4 or 5 APR but giving up poison on hit, but that would have required a change to the spell description. With haste and other buffs and protections, the form can still be used effectively until late SoA I expect. Whether a fix like this is for Beamdog to make is debatable. @Flashburn and @gorgonzola in other threads make valid points about the line between modding and enhancing the game, but I'm not here to participate in that debate. Personally I'm all for consistency so I'm ok with the change made to PS spider form. However, it's precisely consistency that I find lacking elsewhere. Since I have not only Xan but also Faldorn, kitted as an Avenger druid in my current run, I decided to take a look at her form. The Avenger's spider form is explicitly advertised as that of a Sword Spider. @kjeron says it gets 5 APR; Faldorn only gets 4 in my install, unless she equips an off-hand weapon. Surprisingly, the Avenger's sword spider form's attacks poison upon hit just like the otherwise weaker Poly Self spider. So the Avenger's sword spider form is allowed to poison its target while the arcane spider form was toned down in terms of APR, most likely because it equaled an unnaturally powerful sword spider with poisonous attacks. Would it not make sense to remove the poison on hit from the Avenger's sword spider form? I don't mind the difference per se, as wizards are much more powerful than Avengers, but it's not consistent. By the way we're discussing nerfs here, but what about tweaks? The cloak of the sewers description says it allows the wearer to change into a mustard jelly. But afaik the cloak's mustard jelly form does not nearly have the resistances of an actual mustard jelly. Or has that been changed as well? But... it's not a feature of the form. I mean, poison is not a feature of sword spiders. Stop and think about it for a second: spiders poison their prey when they bite them. Sword spiders don't have a bite attack - they have sword-like talons. Not even a biological mechanism for poison delivery. So it just doesn't make sense. And honestly, I actually get it if the complaint is simply "but I liked it that way!" It was senseless and wrong, but that doesn't make it not likeable. What I don't get is this talk about "balance." What does this have to do with balance? Who ever said it had anything to do with balance? It seems like you're creating a boogeyman to argue against - balance changes bad! - when in fact it is totally irrelevant. Since the 2.6 patch will include lots of data fixes to spells, this will be looked at. 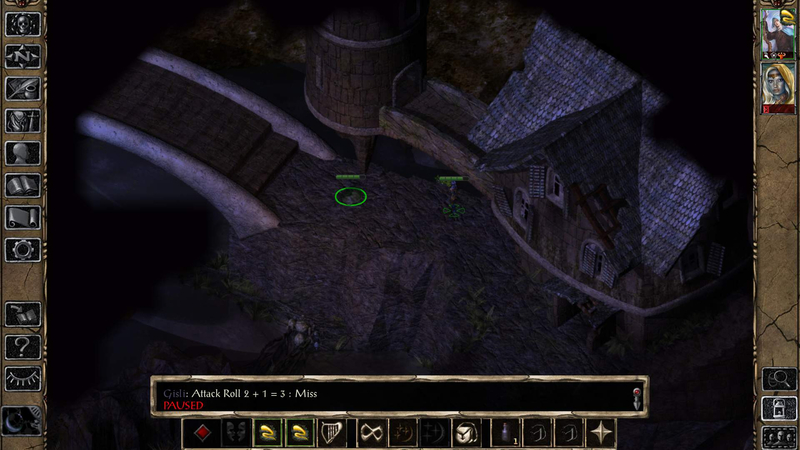 EDIT: Seems to be fixed in BG2EE. Hm, I haven't noticed anything different between cloak Mustard Jelly and Polymorph Self Mustard Jelly. At least, both slaughter Beholders and high level mages just fine.